What you are looking at is a document from the early days of the zombie plague. Little is known about the author before his infection--only that he was a poet. This facsimile of his actual journal recounts the events of humanity's darkest hours through the intimate poetry of haiku. 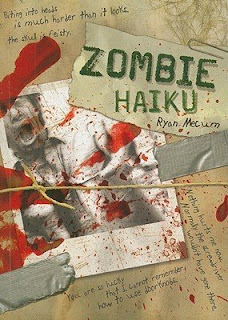 Inside you'll find increasingly disjointed and terrifying three-line poems (all in the classic 5-7-5 syllable structure), and follow the undead poet on a journey through deserted streets and barricaded doors. Experience every eye-popping, gut-wrenching, flesh-eating moment of the eventual downfall of the human race from the point of view of a zombie, and gain insight to help you survive--if you can. When I first saw a copy of this book, I was so grossed out. It's definitely not for me. But then, I'm pretty sure I'm not it's target demographic!. Not that I DO know who it's target demographic is. Young boys who like gross things, blood & guts? I don't know. But it sells! And it's got 4 and half stars on amazon.com from a total of 26(!) reviews! Wacky book, even wackier readers. Chicago and the Meat & Wine Co.